"Chase Mielke's profound and moving insights into the compassionate foundation of teaching will inspire those noble individuals we entrust with our children—teachers—to find passion and purpose. It is a must-read during these complex times." "Mielke speaks to the reader with the heart of a teacher, the wisdom of an oracle, and the familiarity of a friend. Readers will find research-based methodologies aimed at creating fundamental shifts in attitude, understanding, and behavior. A just-in-time antidote for the exhaustion afflicting our nation's teachers. An absolute must read!" "Chase Mielke does the work: he teaches in a classroom like yours and mine. 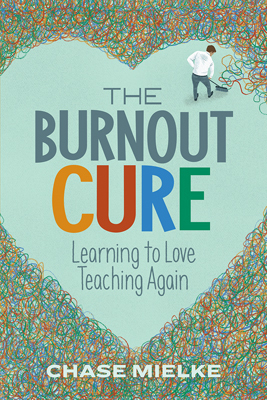 He writes about resolving teacher burnout—and how you can, too, with strategies vetted by both research and real life. Through it all, Chase offers us a coherent framework for understanding how to build flourishing lives inside and outside the classroom. This is a guide I've been looking for." "Chase Mielke is an exceptional educator and an exceptional human being, demonstrated by the authentic way he shares his personal story. His heartfelt writing will resonate with teachers as he shares with readers how to not "simply survive as an educator but thrive, personally and professionally."" Chase Mielke is a writer, speaker, and award-winning high school teacher. He runs a blog dedicated to helping educators better understand and teach social-emotional learning.